‘My Big Fat Greek Wedding’ is very popular here amongst foreigners. Together with the even more popular ‘Mama Mia’ the movies have been leading brides and grooms to descend on the Greek islands for a romantic wedding against a blue sky & sea. However, getting a wedding organized is not so simple – not least because many a papas — the stout, friendly looking Greek priests — are not that keen on marrying people who are not Greek Orthodox by faith. Last year, a few months before ‘Mama Mia’ hit the Greek cinemas, and thinking it rather unholy commerce, the Greek Orthodox Church moved to try and stop the wedding business. So, wedding goers wanting marriages on popular locations like on Crete or Santorini were to be disappointed. However, a year later and the tour operators are still offering weddings to foreigners. There are even catalogues, like The Complete Guide; Weddings in Greece & the Greek Islands. Why is it so popular to get married in Greece? Probably because of the romantic locations. Greece is full of beautiful places and not only on the most well known destinations, where I can imagine you will most likely encounter traffic jams of brides and grooms. A few weeks ago I was surprised when visiting a wedding here on the not so busy Lesvos (it was a real authentic wedding with a Greek bride and groom), that even small local weddings can cause congestion. The bride and groom and all their guests had to wait for another couple who were not yet man and wife. Greeks also like to choose a romantic setting and this place was very special: Anayeri. Anayeri is down from Asomatos, a place full of little streams, huge plane trees, a large park for picnics (which is also used as a car park), a cute little church and a picturesque taverna, only open in the summer. In the autumn it is one of my favorite spots on the island because you can walk through the fallen leaves, and the autumn smells and colours are at their best — but on a warm summer night, lit with strings of coloured light bulbs and spotlights it is a real dream location. There’s no blue sea or sky (which you wouldn’t see at night anyway), but there’s the smell of the trees, the sound of murmuring water and the powerful feeling that you are right in the middle of nature. When the first couple was married and they left with their wedding group — in the dark — they caused a chaotic traffic jam with cars trying to come and go all at the same time in the middle of the forest. But once the sound of their engines had faded away through the trees, the next wedding started. After a simple service in the church, the guests sat down at tables, splendidly laid out with snow-white linen, porcelain plates and crystal glasses (which was unusual, because most weddings use ordinary plates and glasses from the taverna). All this luxury in the middle of a wood! Later, I realized that Greeks like to marry around the 15th of August, when many family members and friends from the big cities of Athens and Thessaloniki are on the islands for a vacation. That night we encountered at least three other weddings. 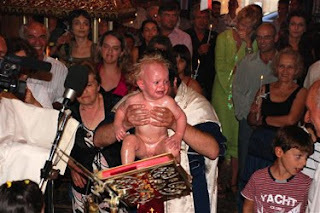 My Greek baptism is quite another story. No foreign tourist would come to Greece to have a child baptized, especially after visiting such a ceremony to see what happens. It is quite cruel: taking off all baby’s clothes; dunking the baby three times under water in the baptismal font; cutting off some hair; turning three times around the font; with the baby screaming like hell — which doesn’t disturb the papas from reciting the endless ritual. Officially, the mother is not allowed to touch her child while all this is going on, which might be fine for five minutes, but after that the mother might well yell as hard as her baby: “give me back my child!” Foreign visitors who witnessed the baptism of the son of a friend of ours could hardly hide their bewilderment seeing what happened in the church; but the old Greek ladies present just had a big laugh at their outraged reactions. You have to be very strong to organize a baptism because this is a family business and everybody wants a say in the event. Mostly the grandparents want the biggest church and the holiest priest; they want the baby to have their name; they come with their own guest list for the party (it is normal to invite not only the family but also the whole village); they criticize the invitations (which are given out to guests together with some sugared almonds and a little toy); not to mention the baptistery candle, the decorations for the church, the sweets that are distributed after the christening and so on and on. The good thing is that it’s the godfather who gets the bill for all these baptismal expenses. When the drama at the church is finished it is time for the second act —the best part of the baptism — where even without a bride or groom to open up the dancing, everyone one eats, drinks and dances just as much as at a wedding. Greeks sure know how to party, another good reason to have your Greek wedding here!